Tension needs a better PR firm. It gets a bad rap in yogaland. There’s an awful lot of talk about getting rid of it like holy socks, or releasing it like animals at the zoo, or letting it go like Chinese lanterns. It seems like we’re always running away from tension, or running to yoga to free ourselves from it. But what do we actually mean when we talk about tension? Do we mean anxious, mental tension? Do we mean anxious, mental tension? In this case, I agree, maybe we don’t want that. 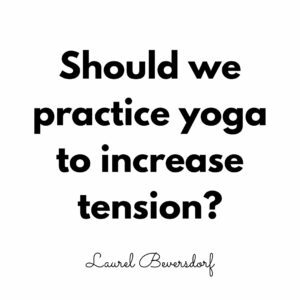 And yoga can certainly help alleviate anxious, tension by teaching us tools to self-regulate. In this case, I agree, maybe we don’t want anxious, mental tension. And yoga can certainly help by teaching us tools to self-regulate. But there’s an awful lot of talk about ‘softening’ muscles, too, which makes me think that maybe what we think we’re trying to get rid of a lot of the time is muscular tension. Now, I’m not suggesting that decreasing muscular tension is always a bad thing. I’m just asking what we mean when we say we’re doing it and if it’s always what we should be going for. And then consider this: would it be okay to encourage students to increase muscular tension sometimes? Like, what if a teacher said, “increase the tension in your neck and shoulders?” It just sounds wrong doesn’t it? I posted on Instagram here about why it’s not wrong, especially if we’re trying to alleviate chronic neck and shoulder tension! Or, does it sound wrong because we have negatively associated tension and actually it’s something we might need more of? Muscular tension is an interesting topic because it’s actually quite complex. First of all, what we feel as tension could be muscles stretching or contracting, but also ligaments or skin stretching. The thing is, unless Google invents MRI glasses, we can never be certain of what’s actually happening biologically to make us feel the things we do. Nevertheless, we’ll go on interpreting our subjective feelings with words to describe them. Words that have multiple meanings, like tension. It’s a bit more straightforward if we take muscular tension to be the mechanical tension generated by muscles. Mechanical tension is pretty clearly defined (albeit not easy to measure since it requires fancy technology like an EMG). Pull your hair and create hair tension. Pull your hair out and create more hair tension than your scalp can manage. Unlike your hair, your hand and arm muscles can generate the tension necessary to grab and pull. In general, muscles generate tension to create movement. They move our bones, pump our heart and allow all our internal organs for function. In short, muscle tension sustains life. It gets a little more complicated when we recognize that “muscles” are also made up of connective and nervous tissue. Maybe a better word for muscle is myofascia. ‘Myo’ from the Latin root muscle, is muscle protein (the stuff that can generate mechanical tension) and fascia is the soft connective tissue all the #fascianistas are crazy about. Finally, without nervous tissue to innervate your muscles, they’d be nothing more than inert meat. Muscle proteins generate tension by contracting. This tensile force doesn’t always shorten the muscle. Sometimes it slows down the muscle’s stretch, sort of like hitting the breaks as you coast downhill. What’s cool is that because fascia is indelibly interwoven throughout muscle, when your muscle stretches, its fascia (which becomes its tendon) stretches too. Stretched fascia stores passive tension. The takeaway? A myofascia that contracts and stretches (something that happens a lot in yoga) generates both active and passive tension. When you add these up, you get total muscle tension. A scene from a Body of Knowledge™ workshop where we’re discussing muscle physiology. Here volunteers demonstrate when a muscle contracts and shortens. This produces less total tension that when a muscle contracts and lengthens. Visualize the tension you’d see in the stretchy bands if the space between ‘the bones’ increased. A stretched muscle is not a relaxed muscle (because when fascia stretches is stores passive tension)! For example, the adductors (inner thigh muscles) of Warrior 2 actively generate (and passively undergo) considerable amounts of tension. Fun fact: for a long time people assumed that the outer hip muscles were outputting the most amount of tension in Warrior 2 to externally rotate the front hip. Then they hooked some people up to EMGs and found that adductor tension was far higher. This is likely because the adductors in Warrior 2 are working from a considerably elongated position whereas the lateral rotators are not. Similar to many yoga postures, posturally speaking, just to be in the pose, Warrior II requires a lot of tension. Also similar to many postures in yoga, it’s a pose where we load several of our joints at end range of motion. Good bony fit at our joints (a component of healthy joint function) requires enough active tension to prevent unwanted positions or overloading forces. I like to think of stability as reflexive tension, a key component of joint tissue resilience. 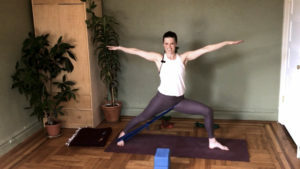 What’s cool about Warrior 2 (and all the asanas) is that approaching the poses in a way that helps generate active, strength and stability-enhancing tension is entirely possible. It all depends on how you approach the pose. This discussion and exploration will theme throughout my upcoming Body of Knowledge™️ anatomy and biomechanics workshops @yogaunion NYC (4 Mondays 6-9p starting Sep 24.) If you are in NYC, join me to explore key muscle anatomy and physiology as it can be directly applied to the asanas. Throughout, we’ll take a close look at how passive and active muscle tension plays a role in posture and movement. #nerdpartay! Wanna learn more? Go here!